Do you ever lay awake at night wondering about your trash or recycling service? You know, those burning questions that randomly pop into your head that you wish you knew the answer to? Well, we’re here to help. Read on for more answers to those consuming questions that keep you up at night. Will the same person service my home every week? When you start service with us, you’ll be placed on a certain route. You will have either one driver, two drivers or a driver and a helper on your route. Sometimes these associates will stay on your route for many years, but they can change, either permanently or temporarily, due to a number of factors. Typically, drivers service only trash or recycling, so you will likely have different drivers for your trash and your recycling if you have both services. We know many of our customers have developed great long-term relationships with the associates who pick up their trash or recycling, but no matter who’s picking up your trash or recycling, you can expect excellent service. How do I know what time my trash, recycling or yard waste will be picked up? Due to a number of factors, we unfortunately can’t guarantee a pickup time, only a collection day. The best thing to do to ensure your waste is collected is to be sure it is out by the time collection starts in your area. In the greater Lansing area and our northern service territory (Alma, Mt. Pleasant and surrounding area), this time is 7 a.m. In Jackson and surrounding areas, we begin collecting at 6 a.m. For Kent and Ottawa County residents, we begin collecting even earlier, so we ask that you have your items out the night before your collection. If you’re not sure when you should put your items out, please email us or put it out the night before, just to be safe. For more information on why you have a collection day, not a time, read our blog post. What if my trash or recycling isn’t picked up? 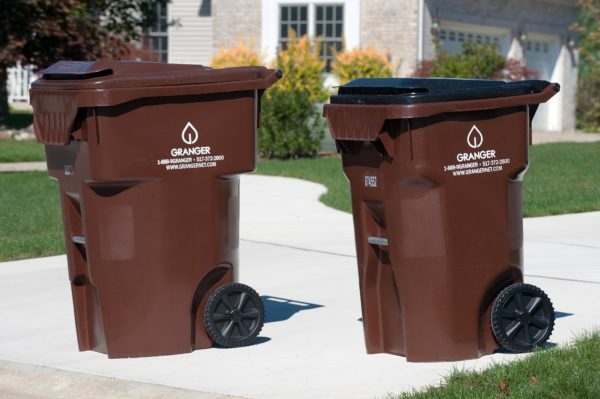 Since most Granger customers with curbside recycling have every other week collection, if your recycling is not picked up, the first thing to do is double check that you’re putting your recycling out during the correct week. We know it’s sometimes hard to remember which week is yours, so we have recycling calendars available here. There are a number of reasons that your trash might not be collected. If you’ve confirmed that it’s your collection day and there are no holiday or weather delays, there may be a problem with what you put out or how you’ve prepared it. Read our blog post for more information about missed collections. Probably not. The one exception is if you have Granger’s blue bag recycling service. In that case your recycling should be placed only in special blue recycling bags which can be purchased online or at local retailers. For more information on blue bag collection, read our blog post. If you have curbside recycling service with a Curby Recycler cart or a tub, please don’t bag your recyclables. The same is true if you use one of our Recycling Drop-off locations. Feel free to transport your recyclables to the drop-off in a bag, but take the items out of the bag before placing them in the container. Is there a limit on how many bags of trash I can put out each week? What happens if I have more than that? Each service level has a limit. If you have a regular size cart, you can fill the cart and place three extra bags outside of the cart. With the small cart, no additional bags outside the cart are included in the service. Bag service usually has a limit of six bags, but this may vary. Please note that there may be different limits on your service if you are part of a municipal or homeowners association contract. If you are uncertain of your limit, feel free to ask. At times when you need to set out more bags than you are allowed, understand there will be a small charge for each additional bag. If you have a lot of extra trash, you may want to give us a heads up and confirm the additional charges ahead of time. Do I need to bag all the trash I put in my cart? What type of bag do I need to use? Please bag all trash before putting it in your cart. This helps ensure that it won’t blow out of the cart when it is being dumped. We also ask that you double bag all pet waste and cat litter. Feel free to use any trash bag that is 30 gallons or smaller. Can I get a replacement cart for my trash or recycling? Is there a charge? We don’t charge for a new cart as long as the damage is accidental or due to normal wear and tear. If damage appears to be caused by abuse or improper use, there may be a charge to get a replacement. To request a replacement cart, fill out this form. Have questions we didn’t answer? Send them to curby@grangernet.com to see them featured in an upcoming blog post.